The bride and groom are surrounded by their immediate family inside the wedding mandap. Items for the ceremony include a coconut, milk, rice, red powder (kum kum) and turmeric powder (haldi). The bride and groom speak their vows in the presence of Agni, the sacred fire, who is the true spiritual witness of the union. 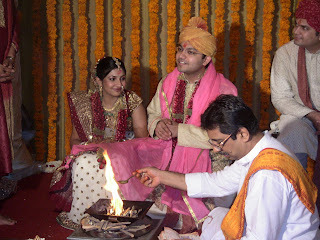 The couple circles the fire seven times (phere) solidifying their union. Family gathers on the morning of the ceremony. 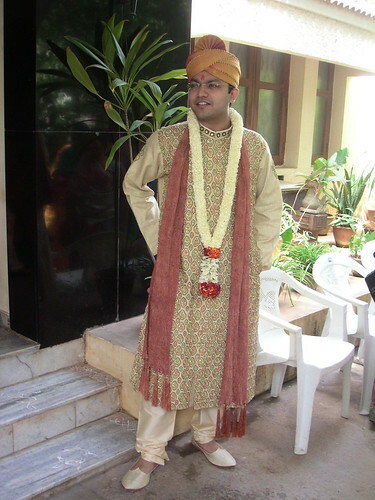 Men get ready to join the baraat, the procession of the groom and his family to the wedding hall. PICT0071, originally uploaded by mbdoctor19. The baraat is the procession of the groom and his family to the bride’s home or to the hall where the wedding ceremony is performed. A band precedes the family, signaling to everyone around that the baraat is coming. The baraat is led by this decorated vehicle, which is loaded with a band and speakers to broadcast the sound. A singer performs traditional songs, leading the groom’s family as they dance, clap, and cheer on the way to the wedding hall. 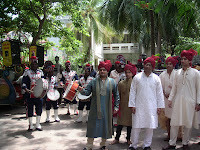 The groom’s family and friends gather with the baraat band. A veil of flowers (sehra) covers the groom’s eyes until he meets his bride under the wedding canopy (mandap). The groom arrives on horseback at the wedding hall, where he and and his family are received by the bride’s family. The bride and groom exchange garlands as a sign of their acceptance of each other as life partners. 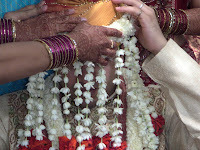 In some communities the bride’s sisters try to block the groom from placing the garland, crying that they won’t let him take their sister away from them. 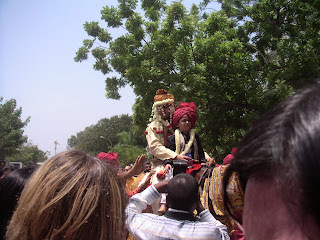 In other communities, relatives of the groom defend him with a shield and the bride is challenged to reach him with the garland. PICT0007, originally uploaded by mbdoctor19. The family prepares their home with fresh flowers, garlands, and lights in the week before a wedding. Guests are welcomed warmly, greeted with gifts and invited to share tea and snacks. The wedding week is an amazing event, with the immediate family coordinating social events and sacred rituals that include the wide community of family and friends. Everyone enjoys a celebration filled with food, music, dancing, and elaborate rituals. 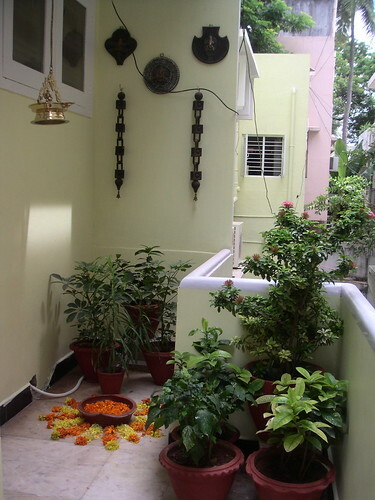 The home is adorned with lights and garlands of fresh flowers, in preparation for the arrival of guests. The application of mehndi takes some time, filling the morning and afternoon with comfortable conversation, laughter, advice, memories, and friendly teasing. Mehndi is a henna paste that is typically applied to the hands and feet of women before a special event, such as a wedding. It is a custom practiced in India, Pakistan, Persia, and other Middle-Eastern countries. In some areas, men also adorn their bodies with mehndi but this is not common. The red color that appears in the hours or days after application signifies shakti, or the essential divine feminine energy.